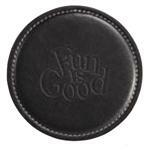 Dress up any office with your company name on our Stainless Steel Coaster. Our exclusive N-Dome™ Imprinting Process is perfectly suited to go with the classic look of brushed stainless steel with black accents on these unforgettable coasters. Price includes up to a four-color process imprint on your choice of background color with N-Dome™ application. Regular production time is 5 working days. 3 3/4” Diameter. Available Colors: Stainless Steel - your choice of background color & four color process! Production Times Available: Regular production time is 5 working days. 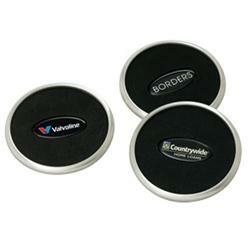 Stainless Steel Coaster with a full color imprint. 24 pounds per 250 pieces.